After graduating from Wellesley College in 1967, Sawyer began her career as a weather reporter on a Louisville, Kentucky television station. In 1970, she took a job at the White House on the staff of Presidential Press Secretary Ron Ziegler. She continued her career as a press aide during the Nixon administration until 1974 and then assisted the former president with the preparation of his memoirs. The transition to broadcast journalism was made in 1978 when she joined CBS News as a reporter in the Washington bureau. When Sawyer accepted the job of State Department correspondent for CBS News (1978-81) she began an unstoppable career as a popular figure in television journalism: She was the co-anchor of CBS Morning News (from 1981), the co-anchor of Early Morning News (1982-84), and the first woman on the network’s flagship public affairs program, 60 Minutes CBS (1984-89). Sawyer left this successful position at CBS to sign a multi-year contract to co-anchor PrimeTime Live on ABC News with Sam Donaldson in 1989. 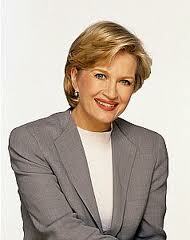 In addition to her impressive professional resume, Diane Sawyer is known for a variety of individual characteristics. Her intelligent reporting and tenacious coverage of the Three Mile Island crisis assisted her in garnering heavy journalistic assignments which at the time were considered a challenge to male colleagues working in early morning news. At CBS Morning News she earned a reputation for skilled reporting as well as her ability to help increase ratings. Her sunny disposition and commanding delivery helped edge the network’s program closer to its rivals in the Nielsen ratings. Her presence and teamwork with Bill Kurtis gave CBS its first healthy ratings in this time slot in three decades. High-profile assignments as correspondent of 60 Minutes established her as a national figure: viewers admired her equally for her personality and her talents as an investigative reporter. Sawyer’s skill contributed to PrimeTime Live’s success and its distinct style. In the fall of 1994, Sawyer signed a $7 million contract and became one of the highest paid women in broadcast news. Margo Howard, entertainment critic of People magazine, writes “…she got to the top with a formidable blend of smarts, drive, [warmth], and earnestness.” Another characterization as “a girl who is one of the boys” points to Sawyer’s authoritative, intelligent, enterprising manner. Another frequently referred to aspect of Sawyer’s work is her willingness to move between two styles–that of a tabloid journalist and the “legitimate” journalist. Diligent reporting pieces coexist with celebrity interviews, such as her coverage of the Iranian hostage crises and the interview with Michael Jackson and Lisa Marie Presley. Sawyer’s distinctive personality has helped PrimeTime Live move towards unqualified success and produce millions of dollars in profits for ABC. All four major networks have sought her services, and she has become a “brand name,” a person the viewers remember, and television personality who can deliver ratings. She remains one of the most visible news figures in U.S. television prime-time hours. Do you want to hire Diane Sawyer? Directly request a quote. In 48 hours we can send you the availability of Diane Sawyer If you would like to book Diane Sawyer, Entertainment Booking Agency is the right place. We will offer you the best price and contact the management or we directly contact Diane Sawyer. For corporate appearances or speaking engagements you can contact our agents and the will help you true the process. Tags: hire Diane Sawyer, Diane Sawyer booking, book Diane Sawyer, Diane Sawyer appearances, find more information on booking Diane Sawyer for appearances, Diane Sawyer speaking engagements, Diane Sawyer endorsements/spokesperson, Diane Sawyer appearance fees, Diane Sawyer booking agency contact info, biography of Diane Sawyer, Contact an artist booking talent agent find a speakers bureau that can book Diane Sawyer, speaker booking agency for Diane Sawyer, Diane Sawyer booking agency, Diane Sawyer booking for corporate event. EBA is one of the biggest entertainment booking agencies in the World. We book hundreds of celebrities, artist, athletes and speakers in a year. Important to know is that we are not claiming to be the management of Diane Sawyer. We are not the official agent for Diane Sawyer. Companies from around the globe book these artists and speakers true our company be course we have one of the biggest networks and we always have direct contact with the artist or the management. We help you to find the right celebrities for your corporate of private events. Please contact one of our agents to get free advice and we will help to get the world-famous artist on your party.